Two, three, or four players use solid paddles made of wood or composite materials to hit a perforated polymer ball, similar to a wiffle ball, over a net. The sport shares features of other racquet sports, the dimensions and layout of a badminton court, and a net and rules similar to tennis, with a few modifications. 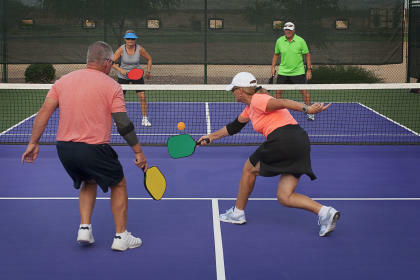 Pickleball was invented in the mid 1960s as a children&apos;s backyard pastime but has become popular among adults as well. This weekend, Chapel Hill Parks and Recreation in conjunction with Chapel Hill Pickleball, will host the first Pickleball tournament in Chapel Hill. The tournament will take place at Ephesus Park (located behind Ephesus Elementary School, at 1939 Ephesus Rd). This site is Chapel Hill’s first dedicated Pickleball facility, constructed in 2016, and has 6 outdoor courts. Pickleball is a relatively new sport, often described as a combination of tennis, ping pong, and badminton. It attracts players of all ages. You can find players 8 years old playing with 80 year olds! One of the teams entered is a grandfather/grandson doubles team. Pickleball is the fastest growing sport in the US, and has the largest membership of any sports and recreation program in Chapel Hill will over 600 players, after beginning with only a dozen in 2012. It is played in both singles and doubles formats, with doubles being more common. Over 170 teams from several states will be coming to Chapel Hill to compete in the tournament from 9am-6pm Friday, Saturday and Sunday. Come out and see top level pickleball play during the tournament. A full schedule of events is available online (https://goo.gl/ncU2o4). To learn more pickleball, and local opportunities for play, please consult the Chapel Hill Pickleball webpages. Brad Hemminger is an associate professor at the School of Information and Library Science (SILS) at the University of North Carolina. In his spare time, Brad loves to play pickleball, ping pong and devotes himself to community and family recreation.